Vidya Volunteers 9335 Posts Recruitment Notification 2016 in Telangana Apply Online @ssa.tg.nic.in Recruitment of VVs Vidya Volunteers in Telangana State Govt of Telangana agreed to Appoint 9335 Vidhya Volunteers in existing vacant posts as per Strength as on 30.06.2016 Aspirants to work as Vidya Volunteers may have to Apply Online @ssa.tg.nic.in Vidya Volunteers/VVs/Academic Instructors Recruitment in Telangana Apply Online at ssa.tg.nic.in from 01.07.2016 onwards. 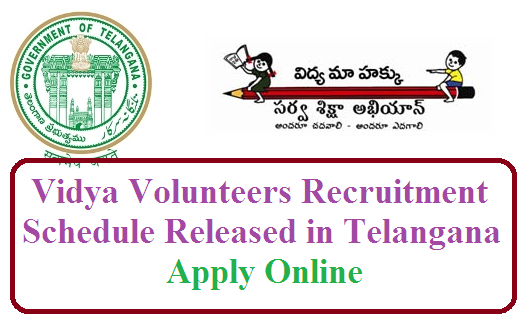 Candidates should apply online for the Recruitment of Vidya Volunteers in Telangana at the Official website of SSA www.tg.nic.in The Director of School Education is requested to follow the Guidelines for the appointment of Vidya Volunteers for the year 2016-17 as mentioned in the Annexure enclosed scrupulously. The Director of School Education, Telangana, Hyderabad shall take necessary action in the matter accordingly.The They are purely temporary and can be terminated before 20th April,2017 also based on justifiable grounds by the School Management Committee (SMC). VVs Recruitment Notification will be issued by the DEO The DEO shall communicate the list of schools along with roster points to the Mandal Educational Officer concerned for engaging the Vidya Volunteers. The Mandal Educational Officers in turn shall display the details on the notice boards of the Mandal Resource Centers, Primary Schools ,Upper Primary Schools, High Schools and all Gram Panchayats in the Mandal . The District Educational Officer shall give press note stating that the eligible candidates shall apply through online and display the details on his website.